The Inspector-General of Police, Ibrahim Idris, halts temporarily, the withdrawal of policemen attached to VIPs. Nigerian big men and women have one more month to enjoy the protection of policemen attached to them. The immediate withdrawal of policemen attached to VIPs initially directed by the Inspector-General of Police has been halted. The decision to suspend the withdrawal by one month was taken after a meeting with the Commanders of Police Mobile Force, Counter-Terrorism and Special Protection Units on Tuesday. A statement in Abuja on Thursday by the police spokesman, Jimoh Moshood, explained the rationale. “The withdrawal will now take effect from April 20, this is to enable the Force to carry out a thorough assessment of the current deployment and carry out appropriate withdrawal. “Meanwhile, the IG has directed the Deputy Inspector-General of Police, Operations, to direct all the Commissioners of Police and their supervising Assistant Inspectors-General of Police in the states and zonal commands to halt the withdrawal, revise and return those already withdrawn to their duty posts pending the new date of April 20, 2018,” the statement read. 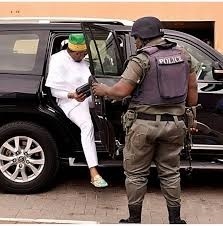 It added that the Task Force Teams set up by the IG at the Force Headquarters, the Force X – Squad and others set up by the AIGs and CPs, have equally been directed by Idris to suspend the enforcement of the withdrawal with immediate effect pending the new date. The force pointed out that those enjoying police protection may be provided personnel at the expiration of the period, from the Special Protection Unit of the Force. It asked interested persons or organisations to apply for re-validation through the CPs of the states where they are resident before April 20.